You are here: Home / Business & Marketing Services / Timec, Inc.
TIMEC was composed of five complementary and integrated energy subsidiaries servicing the refining industry. TIMEC had several members of its management team holding minority equity positions in the individual subsidiaries as its founder and CEO, Briggs Wood, was reaching retirement age. The TIMEC management team negotiated a letter of intent with Mr. Wood while engaging an investment banker to run a process to identify capital providers and create the optimal capital structure for TIMEC to complete an MBO transaction. 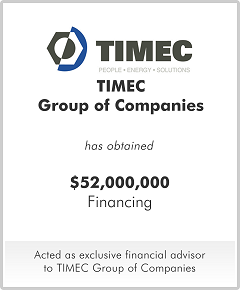 With the assistance of a private equity group, TIMEC's management team completed the management buyout and consolidated TIMEC into a single company with three wholly-owned subsidiaries. TIMEC was composed of five complementary and integrated energy subsidiaries servicing the refining industry that were not consolidated. TIMEC considered various capital structures, including senior debt, subordinated debt, minority and preferred equity and control equity partners. After considering its options, management partnered with a private equity group to lower overall debt and leverage multiple at closing. 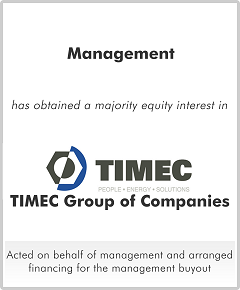 TIMEC's management team completed the management buyout and consolidated TIMEC into a single company with three wholly-owned subsidiaries.